Fifteen-year-old Ruby has had ten really bad days. She's lost her boyfriend, her best friend and all her other friends are choosing sides. She's had more than a few boy problems. Not only that, but she's starting to have panic attacks. Losing a lacrosse game, failing a math test, hurting someone's feelings, becoming a social outcast and have really mean things written about her? Yep, that's happened too. What's a girl to do? If you're Ruby Oliver, your parents will obviously send you straight to shrink to convince themselves you won't be a shut-in all your life. Several appointments later, Ruby's made a boyfriend list and the consequences extend further than Ruby ever could have imagined. By Its Cover: Whatever happened to the ceramic frog? I read this on my Kindle, so the cover didn't really matter. However, I think I might prefer the previous cover of this book rather than the new version. I kind of liked the quirkiness of the frog cover... I don't have anything against this cover, it's just kinda blah. But whatever. Ruby Oliver is one heck of a list writer. That girl can make lists - and overanalyze - with the best of them. I loved that the book was written from Ruby's perspective because she's down-to-earth, funny and just so dang relatable. I thought Lockhart did a great job of capturing her voice, and I loved getting to know her. Even though she had moments of total teen girl syndrome, I still want to be her friend. She's doing the best she can navigating through high school. You'll root for her, shake your head when she's stupid and want to stick up for her and defend her against all the mean girls. There really isn't that much to talk about in terms of romance. 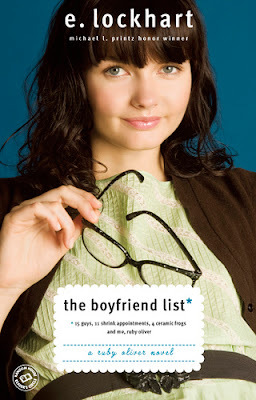 For a book that's all about a list of boys, there isn't too much love stuff going on. I hated Jackson (ugh!) and was intrigued by Noel (hmm...), and that's about the gist of it! Lockhart's dialogue, as I've already mentioned, is spot-on. Ruby's high school experience is both hilarious, relatable and occasionally painful. I was really drawn in to the story and loved Ruby's voice. I loved that Lockhart was able to make her witty and sharp, but she's never mean at the expense of others. Ruby and her parents live on a houseboat. How fun is that?! Actually, it's probably not fun at all... but it made for some really funny reading! I love me some lists, so I adored Ruby's use of them. She is one major list maker! I liked that the entire book was in the format of a list because it made for a really interesting and unique story structure. Ruby is also obsessed with footnotes, and you'll find them interspersed throughout every chapter. I really loved this aspect! However, I didn't love them on my Kindle. Each footnote was a link to the end of each chapter, and it was really hard to actually skip to the footnotes. It was a total pain trying to do it on the Kindle! It's not that hard to flip forward a few pages in a book, but it's a little bit challenging on an e-book. Just a word of warning! "When encountered in groups, the human boy, as our serious documentation proves, is one of the greatest conversational inhibitors known to the female kind. There's nothing to talk to them about! They're jerks when they're with their friends. It's so weird. Scientists are baffled." "Muffin: nice, pleasing, but ordinary. A perfectly fine baked good - but nothing to get too excited about. Not as festive as cake. Not as glamorous as a croissant. Not as scrumptious as a cookie." Bottom Line: Lots of Fun! I really enjoyed the first book in the Ruby Oliver series, and I was reaching for the second book as soon as I finished. Ruby was a realistic teenager, and I enjoyed getting to know her. It's a fun, easy read with interesting thoughts and advice on friends, boys and growing up. Read all four last week :) I think they're so cute and such fun reads! I'm surprised I've never read them before or seen many people talking about them! Ruby is one of those narrators that feels like is speaking DIRECTLY to me. I love her so! Oh my goodness, yes! I just totally fell in love with Ruby - from her lists to her overanalyzing, I really felt like we were friends!